A beautiful fresh and summery side dish to compliment your main meal. Method: Arrange salad ingredients in a bowl. To make the chickpeas combine with spices and coat evenly. Arrange on an oven tray and bake for 20 minutes at 160 degrees Celsius or until crispy * Combine all the ingredients for the dressing in a small jar and shake vigorously until well-combined and smooth. Top salad with chickpeas, spoon over dressing and sprinkle with black sesame seeds. We all need some "comfy" when the weather cools down. A snugly jumper, cups of tea and of course deliciously warming foods. The new season vegetables are in and what better way to celebrate this than warm roasted veggies! 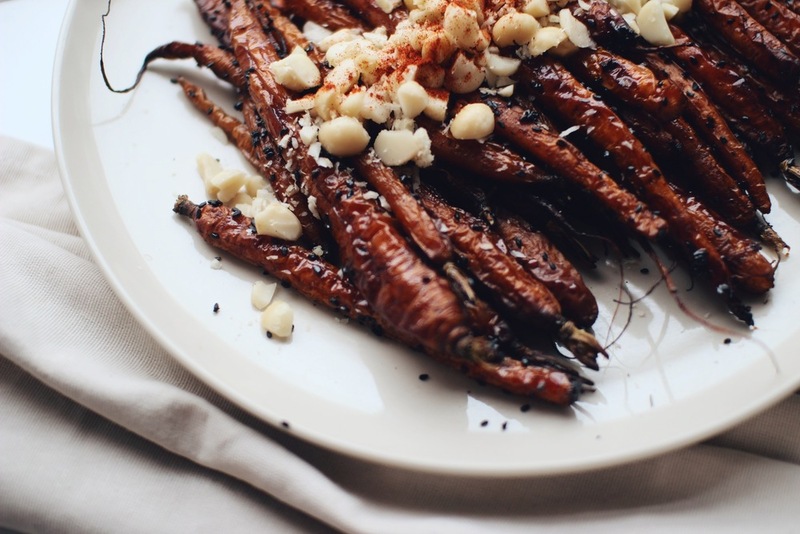 This recipe is super easy and a fun new take on roasted veg. A great addition to your Sunday roast lunch instead of potato or sweet potato, or teamed with your lunch greens and grilled chicken. It even works as an afternoon snack with a tablespoon of hummus! Here's a quick comparison between carrots, potato and sweet potato. You can see that carrots are a lot lower in calories and carbohydrates, but still very high in fibre. Oh! And this will be a super duper addition to my Bountiful Lunch Plate recipe! 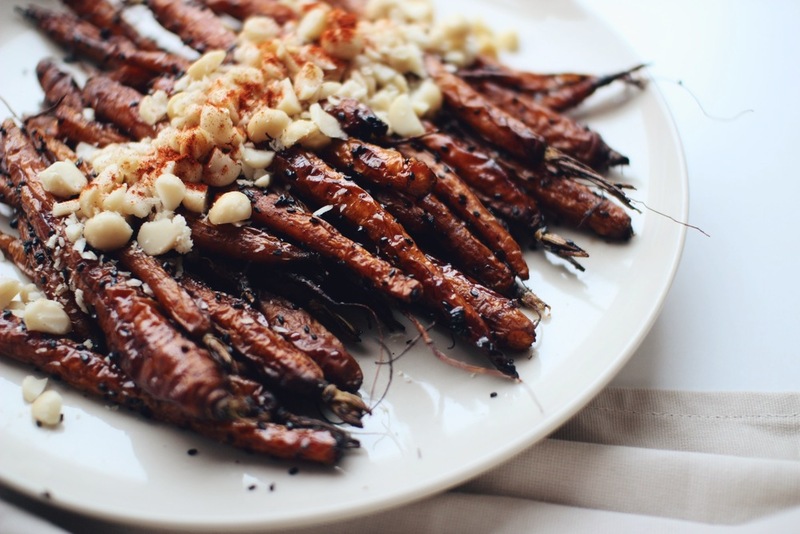 Why not make a big batch of these carrots for the week and add them to your lunches as you go? Leading a healthy lifestyle and achieving your nutrition goals is all about being organised and prepared. Upload your photos on instagram and tag me @notyourtypicaldietitian or share it with me on facebook - here! I love makeovers. Before and after photos of people who lost weight, renovated their home got a new haircut. It's so fun to share in the transformation. But the best makeover of all is when you can take one of your favourite unhealthy recipes and make it healthy! But hopefully in this case, you WON'T be able to taste the difference between before (unhealthy) and after (healthy) - I couldn't! All you get here is a 100% satisfying piece of cake - dense, moist, and chewy. This is packed to the brim with good-for-you ingredients and filling too - so you won't be tempted to have a second slice. I didn't think you needed any reason to eat cake, but in case you do, here are some points on why this cake is so good for you! WHOLEMEAL SPELT flour comes from an ancient grain that contains much lower amounts of gluten than wheat. This doesn't mean our Coeliac friends can eat it, but those with gluten intolerance MAY be able to tolerate it. Wholemeal spelt is also much higher in protein and fibre than regular flour. Some studies have shown that CINNAMON may help to regulate blood sugar levels, which means we won't suffer from that typical sugar slump and we're less likely to overeat at our next meal/snack. MACADAMIA OIL is a wonderful oil that contains a lot of heart healthy monounsaturated fatty acids. It is shelf-stable and has a much higher resistance to heat so it doesn't oxidise as easily as other nut/seed oils. It is rich in vitamin E and squalene, both of which are important antioxidants for beautiful skin. PECAN NUTS are packed with plant sterols that can help lower blood cholesterol. They contain the same healthy fat (oleic acid) that we find in olives and avocados. This nut is also a great source of vitamin B3 (niacin) to help us fight afternoon tiredness and fatigue by accessing the energy that we get from our food. Combine dry cake ingredients in a mixing bowl. In a separate bowl combine all wet cake ingredients and mix until well combined. Oil the inside of a 22cm/8.5inch springform cake tin and pour mixture into the tin. Place the tin in the oven and bake for 35-40minutes or until a skewer comes out clean. Meanwhile, combine all the icing ingredients in a bowl using a hand mixer until creamy. Combine all the topping ingredients in a separate bowl and mix to combine. When the cake is done, remove from oven and let cool completely. Once cake is cooled, use a bread knife to cut the cake in half horizontally. Remove the top layer of the cake and smear half the icing onto the bottom layer of the cake. Place the top layer back onto the cake and smear the rest of the icing on top. Finish off with the with nutty coconut & cinnamon topping – divine! One of my most precious memories as a little girl was coming home from church, the house filled with aromas of the Sunday roast my mum had put in the oven that morning. The whole family sitting down for a long lunch with lots of laughter and jokes, us kids playing under the table and making fun of the mung beans in mum's salad (little did I know about their nutritional value). The moment we were all waiting for finally came at the end of lunch and mum would reveal a perfectly baked Malva pudding from the oven. We could hardly wait for her to evenly divide it so that everyone had their fair share, and then of course with a big scoop of ice cream on top. Back then, you didn't have dessert every night, you had a treat once a week. The desserts weren't low fat, sugar-free, or gluten-free but man did they taste good! Every now and then I will have a craving for this kind of pudding. If you're South African (like me) or if you have any South African friends, I am sure they would've told you about this pudding before. It really is heavenly in taste, but unfortunately being laden with sugar, butter and cream, not so heavenly for your health. So here is my best recreation of a healthier version. Remember that any dessert, whether healthy or unhealthy, is still a treat and should only be enjoyed occasionally. Combine all pudding ingredients except the flour and bicarb in a bowl and whisk until well combined. Add the flour and bicarb little by little as you continue to whisk. Place in oven and bake for 20 to 25 min or until golden. Meanwhile, combine all sauce ingredients in pan over low heat until small bubbles form. Remove pudding from oven, cool for 5 to 10 minutes and cut into squares. Pour the sauce over the pudding and allow to absorb. Serve with extra sauce and/or whipped coconut cream - yum! Afternoon snack time comes around and every day we find ourselves with the predicament of trying to sidestep the dreaded office fundraiser chocolate box and try to convince ourselves to stick with the celery sticks and hummus instead. But let's be honest, vegetables cut into "fun size" and homemade bean dip can start to grate on your already-monotonous work routine. Clients ask me all the time for snack ideas on how to satisfy the afternoon sweet tooth munchies, without labour-intensive prep time or weird ingredients. This is one of my go-to snacks for afternoon tea time. 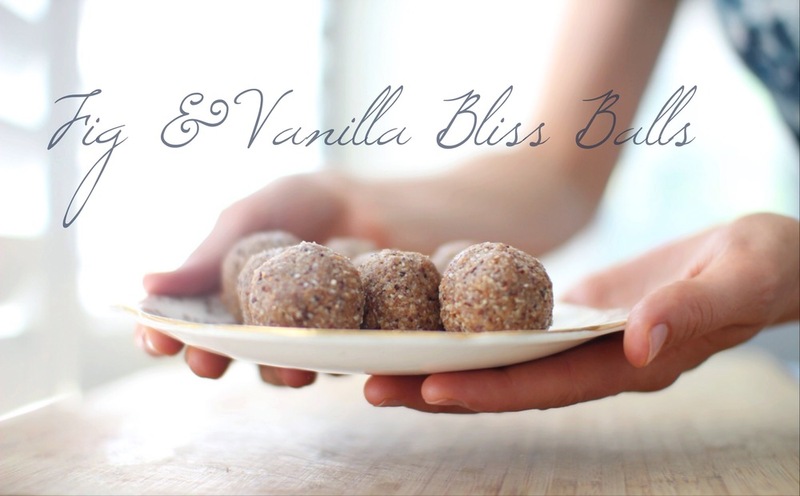 I like to have 2 bliss balls with a cup of herbal tea or chai tea with almond milk. Packed with healthy fats, protein and fibre these bad boys will leave you satisfied and keep you full until dinner time. Dried figs bring natural sweetness to this snack, and contains a good dose of calcium and iron, as well as vitamins A, E, and K.
Whizz it all up in a blender until finely chopped. The consistency should be dry touch but moist enough to roll into a ball and stick together. If it is too dry, add more sweetener. If it is too moist, add more almonds or coconut. Roll into balls and refrigerate. Enjoy with a cup of herbal tea. Would you like more recipes like these? Australia is warming up and we're getting ready for summer - hooray! With summer comes sun bathing, flip flops, and of course ice cream! We are definitely not willing to sacrifice our bikini body that we'll need to flaunt on boxing day though, so we need guilt-free options. Here are 3 healthy, delicious, and very summery popsicle recipes that are super quick to make! Stir sweetener through the thawed out blackberries. Do the same with the yoghurt, but keep separate from the berries. Layer popsicle mould with a layer of yoghurt and a layer of berries. Continue this process until filled. Pop in the freezer for at least 4 hours. Combine all ingredients in a high speed blender until smooth. Fill moulds and freeze. Combine all ingredients in a high speed blender for at least 1 minute. Fill moulds and freeze. My sister and I have been eating no sugar for 5 weeks. She asked me if I wanted to cut out sugar with her for a whole 8 weeks to help keep her accountable. I agreed without realising how difficult it is to actually avoid the stuff. It is literally EVERYWHERE and my eyes have really been opened to how much we eat of it without even realising. I am still allowing myself fruit though - I could never live without fruit, it is my favourite food in the world, really! Add ingredients to a blender and combine on a high speed until creamy. A few Saturdays ago I got together with my mum and sister, and we put our heads together to come up with something that so many of us often struggle to find. The perfect afternoon snack. 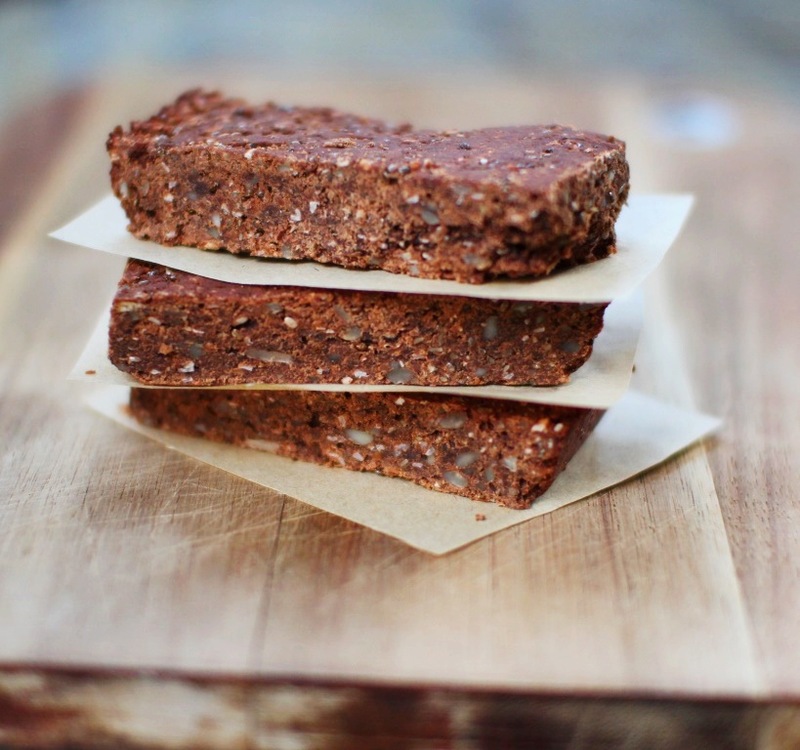 I'm happy to say we ticked all of these and created the perfect protein bar from the very heart of my mum's kitchen. We could hardly wait for the bar to cool so we could taste test it. When we did, we all nodded in agreement that this was the best we've tasted. Heck, even the boys that were watching rugby upstairs gave it the tick of approval. If I can get my husband to say "that doesn't taste healthy at all" - it is probably the best complement he can give to my healthy creations! Method: Preheat oven to 175 degrees Celsius. Combine all ingredients in a high power blender. Blend until well combined. Line a bread pan-sized baking tin with baking paper and press mixture firmly into the tin. Bake for 15 – 20 minutes. Remove from oven and let cool completely before slicing. Makes 12 slices. It is delicious with a dollop of yoghurt and some warmed berries! It is this innocent-looking delightful treat on the high tea tiers that makes us second guess the healthy eating vow we murmur to ourselves as the tea is being poured into our fine china cup. Not Your Typical Dietitian has developed the "Not Your Typical Macaroon" and gave it a healthy twist, without refined sugar and butter. I am not saying that this treat is that healthy that you can now gorge yourself on them, but they're definitely a better option than the macarons you'll find staring back at you through the glass casing at the patisserie. And they have real fresh strawberries in them! Method: Combine dry ingredients. Warm coconut oil and honey in a bowl suspended in hot water until runny, then add vanilla. Combine with dry ingredients. Once well combined, carefully mix through the strawberries. Use your hands to form into macaroon shapes and place on baking paper. Chill in fridge for around 1 hour or until firm. Keep refrigerated in an airtight container. Will keep for 1 week. IMPORTANT: You probably noticed that these babies don't require any baking. However, if you would like to bake these for a crunchy outer casing and soft chewy centre, then you can bake them at a very low temperature (140 or 150 degrees Celsius) for around 40 to 50 minutes. The key is not letting them brown too much - so keep an eye on them! I am a big fan of preparing ahead for meals. It means my week is less stressful and more organised, which also means I stick to healthier options. This week I had so many things going on that I completely forgot about the mix of quinoa and wild rice made up to add to salads or to use as a base for hot dishes. There was no way I was going to waste this precious bundle of nutrients. So from there....the wild rice and quinoa muffin was born with the ever-so-complimentary additions of date and banana. The ultimate must-have's in a muffin? I think so! Even the nutrient profile is impressive, delivering all 9 essential amino acids (proteins) as well as a good dose of fibre and healthy fats. Pre-heat oven to 180C. 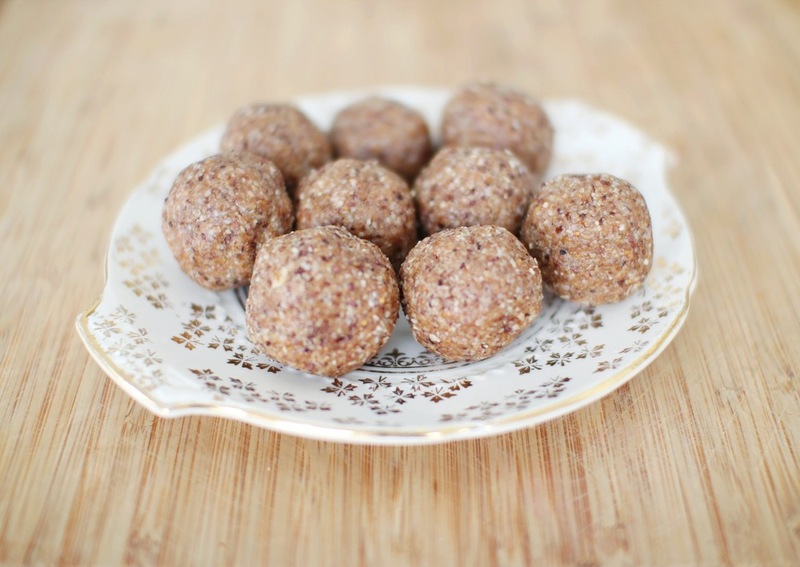 Combine almond flour, protein powder, quinoa and wild rice mix, spelt flour, baking powder, and coconut sugar in a bowl. In a separate bowl, combine the bananas, egg, milk, and vanilla. Mix the wet ingredients into the dry ingredients. Finely chop the dates and fold into the mixture. Scoop into a muffin tin and place in pre-heated oven. Bake for 25 to 30 minutes or until golden and the skewer comes out clean. Dust muffins with cinnamon and enjoy warm with a cup of tea. You might think that this muffin combination is a bit strange. But don't knock it until you've tried it. It really delivers on taste. Rhubarb is really in right now. Especially since it's winter here in Australia. So I made a rhubarb and raspberry tart to celebrate (healthy style of course!). Here's how I did it. Method Preheat oven to 200 degrees Celsius. Using a food processor, lightly process the oatmeal, coconut, and nuts until the nuts are just broken. Add the oil and syrup and pulse until the mixture is combined enough to stick together. Press the mixture firmly into a tart tin using clean fingers. Place in a hot oven and bake for 8 to 10 minutes or until slightly golden. Meanwhile, heat a saucepan on medium heat and add raspberries and chopped pear. Using a potato masher, squash the fruit to release juices. Stir in the syrup and vanilla until combined. Add the rhubarb and cook for approximately 10 minutes, stirring the contents to prevent it from burning. Once the rhubarb becomes soft and starts to disintegrate take off heat and add the arrowroot to thicken the mixture. Cool slightly. Pour rhubarb mixture into tart base and spread evenly to cover pastry. Place in the oven and reduce heat to 180 degrees Celsius. Combine the ingredients for the topping and sprinkle over tart after 20 minutes of baking. Bake for another 5 to 10 minutes. Remove from oven and eat warm with coconut ice cream. Heaven!! This one was eaten with Greek yoghurt, crushed berries and honey, but the flavours in your mouth turn into a party when paired with some homemade or store-bought coconut ice-cream. This dessert is satisfying, warming, and delicious - everything you want in a winter dessert. This is my kind of food, because it tastes naughty but is actually VERY healthy. And who doesn't want guilt-free indulgences right? Especially when the weather is getting chilly! The main feature of this dessert is the pear. I am a bit obsessed with pears at the moment. They are really cheap at my local farmers market and I love how versatile they are. You can use them in smoothies, grate them into bircher muesli, add thin slices to a lunchtime salad, or even as a marinade for meat (think Korean food....yummmm). They're delicious added to freshly squeezed green juices too (I love kale, cucumber, lemon, and pear). And of course, as a dietitian, I love pears for their high fibre content - a whopping 7g of fibre in one pear! We all need at least 30 grams of fibre per day, so you can see that eating a pear a day pushes things along nicely (literally)! Pre-heat oven to 200 degrees Celsius. Wash pears, cut into quarters, and remove core. Set aside. In a bowl, combine warm water with stevia, honey, and vanilla extract. Add pears and mix to coat pears with syrup. Place the mixture onto a roasting tray and sprinkle liberally with cinnamon (about 2 teaspoons all together). Bake for 20 minutes and then turn pears so the skin faces out (this is to get that crispiness). Bake for another 10 to 15 minutes or until skins are crispy and golden. Serve warm (or cold) with ice cream. Place frozen banana and vanilla extract in a high-power blender and blend until you reach a creamy consistency. Add almond butter and blend until well incorporated. Use an ice cream scoop to serve, and drizzle with a little maple syrup. What is your favourite pear recipe? Link of the day: Why not make this Maple Brown Rice Pudding with pear? Just old-fashioned deliciousness and amazing flavour. I can pretty much guarantee you won't want to make the old version again. Even my husband agreed this is as good as what his grandma used to make - and he is a connoisseur in desserts. 1. Preheat oven on 180 degrees. 2. Combine shredded coconut, flour, oil and honey in a blender until well mixed. 3. Press dough evenly into bottom of prepared baking pan (~20x15cm) and bake until light golden brown (10-15 min). 4. Whisk egg, egg white, and the honey-syrup mixture in a large bowl until blended. Grate zest and squeeze juice from lemon; add to egg mixture. Add baking powder and flour. Mix thoroughly. 6. Cool and lightly dust with icing sugar using a mesh strainer. Slice into squares. For an extra bit of fancy, you can combine ricotta with some maple syrup and lemon zest to serve on the side. Greek yoghurt would also be divine! Go do yourself a favour and make a batch of these. Then hurry right back and come and tell me how you liked them. I will be a very happy girl. I love bread. It is definitely one of my weaknesses. If I didn't know better and didn't have all the nutritional knowledge from studying for 6 years, I'd probably eat french bread sticks and sourdough from my local baker with lashing of butter at every meal. But unfortunately (and fortunately for my health and yours!) I do have the knowledge. By no means am I saying that bread is bad for you. There is definitely a place in a wholesome, well-balanced diet for bread that has been made from good quality ingredients in small amounts. But unless you're willing to fork out $8-$12 for a good quality bread these days (or have the skills of a Danish bread maker) you're stuck with the mass-produced loafs from the supermarkets. These are often laden with processed wheat products, soy flour, colours, preservatives, sugars and syrups. If this is news - learn to read your labels. One of my passions is to create healthy versions of everyday foods and dishes, and to encourage others to do the same. I simply had to look for a healthy alternative. These sorts of pursuits don't often stop until I find what I look for and it has ticked all my nutritional boxes. It didn't take me long though, to find this life-changing bread that was geniusly invented by Sarah at My New Roots. When I saw it, I simply had to try it. The end result was a very impressed dietitian with a huge smile on her face holding a piece of life-changing bread in her hand. With lashings of homemade jam (my treat). The best thing about this bread? It actually is HEALTHY for you. And it is REALLY easy to make, with minimum kitchen mess. You the combine ingredients, stir, soak, and bake all in the one dish - perfect! Today is Salad Inspiration day - and this one will fill up your tank with lots of flavour, fibre, and fat-fighting goodies! Add the chopped onion and cherry tomatoes to the protein rice, and lay the mixture on a bed of green leaves. Place tahini, lemon juice, almond milk and spices in a small glass jar and shake vigorously until well combined and a dressing consistency is achieved. Pour the dressing over the salad and top with goats cheese fetta. Enjoy! What is your favourite go-to salad? Happy Dietitian Day everyone!! I'm sure that this is probably the first time you've ever heard that there is an actual day to celebrate Dietitians. Well if that is you, all the more reason to fimiliarise yourself with what Dietitians do, where to find your nearest Accredited Practicing Dietitian, and more importantly, how we can help you! Take a look at the Dietitian's Association of Australia website! But first...let's celebrate Dietitian's Day with a salad...boring??? Not at all!! This one is so delicious, you won't even know that you're eating a salad - I promise! Step 1: Roast veggies for approximately 30-40 minutes in a moderate to high oven with olive oil. Step 3: Steam broccoli for 2 to 3 minutes or until cooked but still slightly crunchy. Step 4: Combine the tahini, almond milk, lemon juice, chilli powder and garlic powder in a small glass jar and shake to combine until it forms a creamy sauce consistency. Step 5: Mix together the spinach leaves and broccoli. Top with grains, roast veggies and tahini sauce. Enjoy! The tahini sauce and creamy roasted pumkin is a match made in heaven! This provides at least 3 out of the recommended 5 serves of veggies for the day. It is also gluten free, vegetarian and vegan friendly, and a great choice if you're watching your waistline! The high fibre content will keep your insides healthy and regular and help with weight management and blood sugar control. The tahini sauce packs a good dose of calcium and omega-3 fatty acids! Sold yet? Give it a try this week and let me know how you liked it! 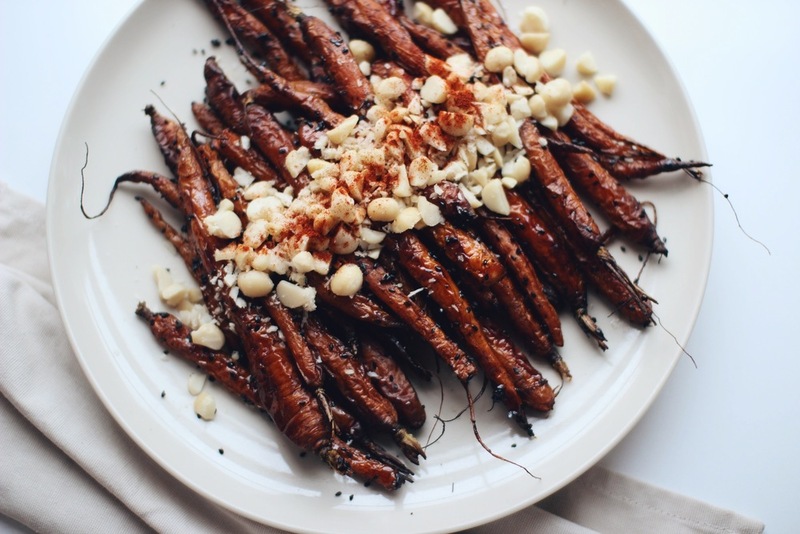 What is your favourite way of having roast veggies? There are few things as satisfying as enjoying the taste, smell, and look of your food whilst knowing that it is good for you. It is even better when it is easy and quick to make! This chicken is so tasty, you'll never want to make it any other way! But there is a bit of cheating involved which cuts prep and cooking time in half and gets the food on the table in less than 15 minutes! Whatch out Jamie! Method: Evenly space the tenderloins between 2 leaves of baking paper or cling wrap. Take a kitchen hammer or the flat end of a wooden spoon and give it a few good whacks to flatten the meat. This greatly reduces the cooking time! Uncover the meat, make a few small cuts/slits in each tenderloin, and spread the paste evenly onto each side. Cover it with the paper and massage the paste from the outside into the meat on both sides. Heat pan. Meanwhile, wash the leaves and dice the avocado. Combine the cherry tomatoes, a 1/2 tablespoon of olive oil and 1/2 tablespoon balsamic vinegar. Pour onto an oven tray and bake in very hot oven for 5-10 minutes. When the tomatoes start to blister take them out of the oven, squash them slightly with a potato masher to release their juices. Add the remaining balsamic vinegar. Combine the tomato mixture, salad leaves and avocado in a bowl. Mix well. Add the remaining olive oil in a pan and grill the chicken on each side for 2-3 minutes or until cooked through. Stack the chicken tenderloins onto the salad mixture and enjoy! If you're looking for more sustenance, the addition of some 4Grain Protein Rice would be perfect! What is your favourite way to cook chicken?